$65.00 In stock. Order in the next 1 hour, 21 minutes and it will go out today! In stock. Order in the next 1 hour, 21 minutes and it will go out today! How do you make your sponge magic more organic? 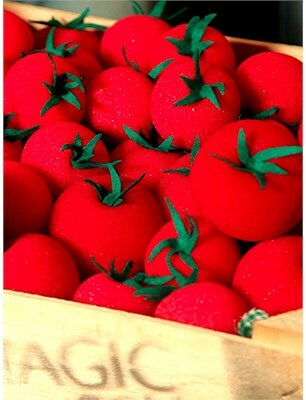 With Sponge Tomatoes from Undermagic. These Sponge Tomatoes let you do all your best sponge ball moves. They're "super-soft" for maximum compression and designed and manufactured by Goshman. Then Undermagic adds the final touches including the cute green stem on the top. As you know, Goshman is the name, when it comes to top quality sponge products, so you can be assured that you're getting the best. 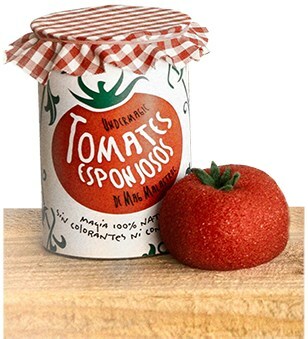 You get the tomato can, four 2" sponge tomatoes, four 1" cherry tomatoes and a link to an instructional video download with some great applications and ideas. PLEASE NOTE THE DOWNLOAD IS AVAILABLE IN SPANISH ONLY!!! Add a squeaker and you get a tomato that needs some "salad oil!" Add the Jumbo Sponge Tomato for your climax and your family audiences will be shouting "Holy Tomato" before they even finish their salad! Multiply them in a continuous appearance from your mouth... there are so many possibilities! The sponge tomatoes are great for the strolling restaurant magician, or the magician doing a nutrition-based school show. Click on the video above on the amazekids.com site and see how great-looking these props are. 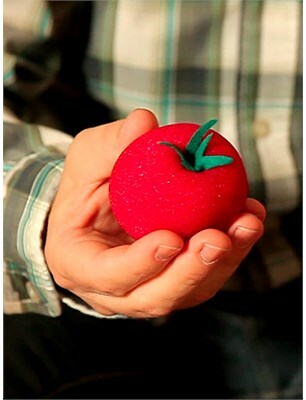 Get a set today and with a bit of practice, you'll have the audience eating (tomatoes) right out of your hands!